Rebecca Lobo, left; Ray Allen, right. 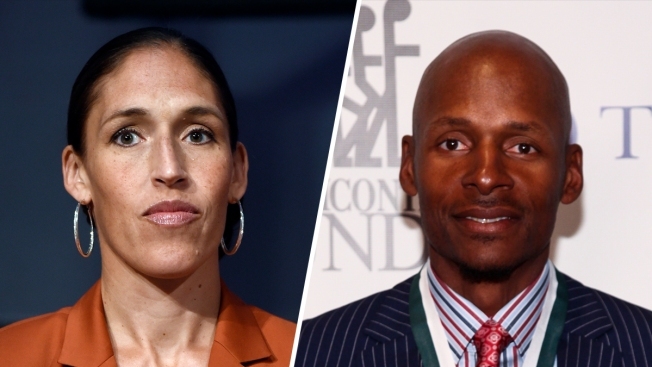 UConn has announced it will retire the numbers of all-time basketball greats Ray Allen and Rebecca Lobo. Lobo and Allen are both now enshrined in the Naismith Memorial Basketball Hall of Fame in Springfield. The pair are the first two to have their numbers retired by the university, an honor that will be reserved for future UConn basketball alums who are inducted into the Basketball Hall of Fame, according to a news release from the school. "Rebecca and Ray are two UConn Basketball icons who were integral to the success and growth of both programs and I am thrilled that we will be able to recognize them in this special way," director of athletics David Benedict said. Allen's number 34 and Lobo's number 50 will be retired at a ceremony during the first weekend of March, according to UConn. Lobo's number will be retired on March 2 during a UConn women's game against Houston and Allen's number will be retired on March 3, during a game against USF. Both numbers will become unavailable for any future players to wear after the ceremony. Lobo was a part of the 1995 team that went 35-0 and won the program's first of many national championships. She was the unanimous National Player of the Year in 1995, a two-time First Team All-American, and was twice named the Big East Player of the Year. "I spent four amazing years wearing the #50 on my UConn jersey and am honored and thrilled that it will have a permanent home in the rafters of Gampel Pavilion," Lobo said. "I am forever grateful to Coach Auriemma and CD (Associate Head Coach Chris Dailey) for the impact they had on my life and would like to pass along congratulations to Ray as well." Lobo finished her college career with 2,133 points, 1,268 rebounds, and 396 blocked shots. She went on to win a gold medal with the Women's National Basketball Team at the 1996 Olympics in Atlanta and played in the WNBA for six years. Allen is one of the most prolific scorers in UConn history. He scored 1,922 points in his career - fifth most at UConn. His 44.8 three-point field goal percentage ranks first at the school. He is a two-time All-American and was the 1995 USA Basketball Athlete of the Year. Allen spent 18 years in the NBA and won two NBA Championships. He was an 10-time All-Star and his 2,973 three-pointers are the most in NBA history. "It's truly a great honor," Allen said. " I know in the history of the program, nobody has had their number retired and to be the first is really unfathomable to me." Allen thanked UConn and its fans for their support. "I would also like to congratulate Rebecca and I hope this can set a precedent going forward as a way to honor men and women who have had exceptional careers in college and afterward," he said.